There’s a 12-mile span of highway in north-central Washington that’s designated as a “high kill area.” Along this stretch, drivers grip their steering wheels with tight knuckles as they test their luck and barrel through the migration route of Washington’s largest herd of mule deer. In the sublime landscape of Washington’s Okanogan Valley, generations of mule deer, Canada lynx, and other iconic wildlife species have roamed and made their home in dry pine forests, sweeping sagebrush and breathtaking lowlands. They have migrated through this habitat from the North Cascades in the west to the Kettle River Mountain Range in the east to find food, mates, and to adapt to a changing environment. This has been their home, their habitat…and a highway runs through it. Running alongside the Okanogan River, Highway 97 is a busy transportation corridor and serves as an important thoroughfare for more than 5,200 commuters, freighters, and travelers every day. All that traffic is tragic for wildlife. Between miles posts 299 and 312, there lies a bottleneck where the highway cuts through the traditional migratory path of Washington’s largest herd of mule deer, and divides precious habitat for Canada lynx. Animal-vehicle crashes in this “high kill area” alone result in the deaths of 350 mule deer every year – and that’s just a conservative estimate. Give today to save the lives of mule deer crossing Highway 97! These accidents not only cost the lives of wildlife, they also cost a lot of money. At an average of $6,500 per accident including vehicle damage, Washington State Patrol and emergency medical response, value of the deer, as well as clean up by the Washington State Department of Transportation (WSDOT), overall these collisions cost drivers, insurers, and taxpayers approximately $2,275,000 annually. A graphic rendition of how one wildlife crossing under Highway 97 in the Okanogan Valley would look — but only with your help! 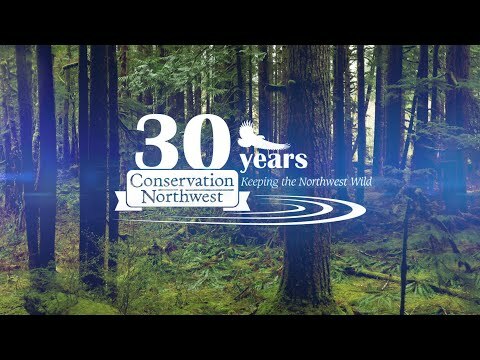 Conservation Northwest has been working to connect habitat for nearly 30 years. We led the way to support wildlife crossings along I-90 to reconnect the north and south Cascades for elk, deer, pikas, and other species. Construction on the first wildlife overcrossing is now nearing completion just east of Snoqualmie Pass. Now we’re turning our attention to the critical impasse along Highway 97 between the towns of Riverside and Tonasket. We’re excited to announce our Okanogan Wildlife Crossing Campaign, Conservation Northwest’s effort to raise funds to reconnect vital habitat and restore migration routes for mule deer and wildlife through the purchase and installation of a underpass crossing near the Carter Mountain Wildlife Area. This wildlife crossing structure will be the first of its kind along Highway 97, and will create safer passage for both people and wildlife traveling through this valley. One underpass will cost $300,000 to build. Luckily, we are sharing this cost with two key partners, the Mule Deer Foundation and the National Fish and Wildlife Foundation. Conservation Northwest’s share of the cost for the wildlife crossing is $125,000. If we raise this funding by the end of this year, the Washington State Department of Transportation (WSDOT) has agreed to donate the cost of construction and labor to install the underpass in this bottleneck location. With the purchase and donation of this first structure to the state, our ultimate goal is to encourage the Washington Legislature to fund additional wildlife crossings for this critical stretch of Highway 97 in its 2019 Transportation Budget Bill, solving this collision crisis for good. At Conservation Northwest, we believe we owe it to wildlife to do what we can to ensure their long-term survival. After all, “keeping the Northwest wild” is not possible without wildlife. This is where you come in. You can help Northwest wildlife thrive in a changing climate and landscape. You can be part of this vital project. Every gift, every dollar, helps to buy concrete and rebar to build the first-ever Okanogan wildlife crossing. Your support will make this first underpass a reality, and will save the lives of at least 350 mule deer every year. That means one deer saved every day after this wildlife crossing is complete. Additionally, the underpass will restore habitat connectivity for threatened Canada lynx as well. Please donate today to create safer passage for people and wildlife. It’s easy – just click here and select “Highway 97 Wildlife Crossings” in the Gift Information drop-down menu. Every day we wait means one fewer mule deer in Washington state. UPDATE: We’re 40% toward Conservation Northwest’s $125,000 share of the underpass costs. Your gift gets us closer to our goal!